qualified engineers carry out inspections and necessary repairs on customers' vehicles. This is me, Stuart Cameron, the working boss of the company – I’m fully-skilled and have been in the trade for over 35 years. 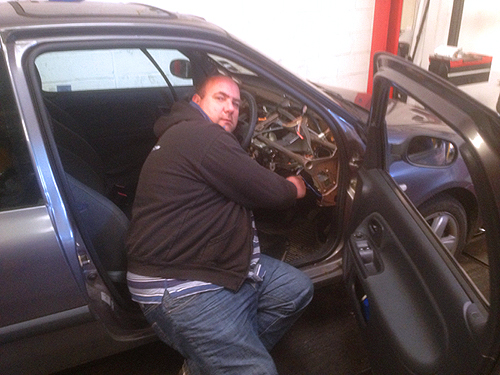 I’m excellent at diagnostics and fault-finding, an MOT tester and top-class mechanic. Before setting up SC Auto Services in Cheltenham I was a Foreman and Workshop Manager at three different garages. I also have a keen interest in rallying and motor sport and held the Guinness World Record for a car jump stunt from 1990-91 with a jump of 210 feet at Bovingdon Airfield in 1988. Craig Cameron is my son - he is at college at the moment and works here during his free time. 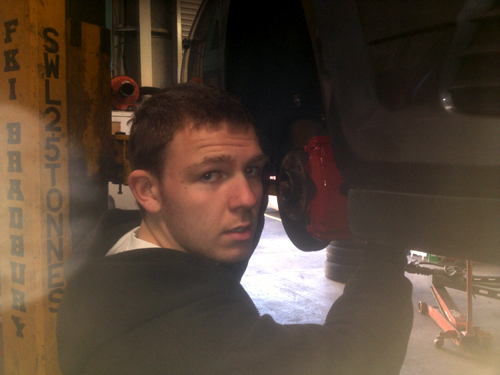 Being my son he has been a mechanic since he was 10, so is very capable and experienced to undergo any type of work. Craig also owns SCA Motorsport - a Cheltenham-based company offering competition and performance parts to clients at all levels of motor sport. SCA Motorsport is an official UK distributor of Bimarco seats. Bimarco produce FIA-approved sports seats and racing shell seats. Every day their products are tested in the toughest conditions in all kinds of motor sports. Drivers supported by Bimarco seats can handle the most powerful machines more easily. Many popular and titled drivers have already trusted Bimarco - their seats have fantastic holding capability. Bimarco seats provide a selection of FIA approved bucket seats for those wanting that added level of safety. Have a browse through our Bimarco range and see what convinced them - you can join the champions! SCA Motorsport also offers a huge range of products from basic nuts and bolts to hydraulic handbrake systems and engine breather systems etc. As well as this we can offer to you a wide range of services including; part replacement, motor sport vehicle preparation and on-event support.